Cute. Accurate. A clever melding of subject and medium. cute... but... unless that's a wanted poster, that's an inappropriate apostrophe. just saying. Yes, the grocer's apostrophe befouls us again. 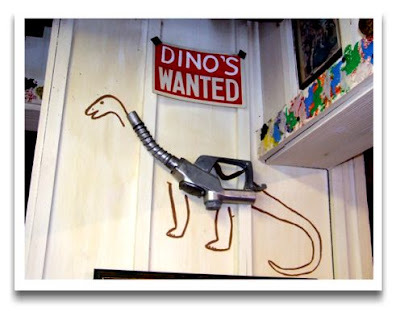 Also, I didn't realize what you meant until Spencer explained that it looks like a contraction for "Dino is wanted." NOW I get it.